Chris Hillman could fairly claim to be called the forgotten father of country-rock. While his erstwhile musical partner, Gram Parsons, burned brightly and died young, cementing his legendary status, Hillman has been steadily performing in the vanguard of country-rock for almost four decades. 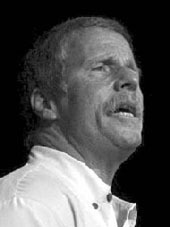 Whether it was first introducing country songs to the Byrds; helping Parsons push the Byrds towards Nashville and then later form the Flying Burrito Brothers; being Steve Stills' right-hand man in Manassas; or playing with Herb Pedersen in various groupings, Hillman has built up an impressive body of work. Triste spoke to him in July 2003. Triste: You’ve been touring recently with Herb Pedersen as an acoustic duo - I saw the gig in Manchester and enjoyed the show. Do you enjoy the music now as much as you have done in the past? How does it compare touring with Herb? Chris Hillman: It’s different now but I enjoy it more than I did then. I think I appreciate it more now and I love playing acoustically. This is the way I started. Herb and I met each other forty years ago when we were both eighteen years old, playing bluegrass, and that’s what drew me into music, and I enjoyed every particular part of my career. But now I enjoy it because it’s the twilight of my career, where I can play what I want and I can play when I want and where I want. And that’s the greatest part it all. So it’s sort of a right that I’ve earned. I can record records the way I want to. Triste: Yeah, so you play, what, twenty, thirty shows a year, possibly? No more than that? Is that about right? Chris Hillman: No, we play when we want to and it’s a situation that’s comfortable for us. We’re doing some shows actually in the next month with Poco of all people, who have reformed. Without Ritchie Furay, but oddly enough it’s Poco, and then Ritchie is playing solo, and then Chris and Herb are playing solo. But we do quite a few shows and I don’t like to travel as much as I used to, but I’m very grateful to have the opportunity to still perform. Triste: If you don’t mind me asking, do you do other things as well as music now? Have you got other occupations? Chris Hillman: The only thing that takes up my time other than music is raising my fourteen year old son. My daughter’s in college, so I have a fourteen year old son in high school, which takes up a lot of my time, but other than that I think I could safely say I’m semi-retired. So I do sessions, still for people, friends. I’m doing some sessions next week for a friend of mine who used to be in the Kentucky Colonels with Clarence White (Leroy Mack). He’s doing an album. And, you know, basically the music probably takes it, but as far as other hobbies, no, I don’t paint. Other than read history and lots of time for reading and working around the house, that’s about it! Triste: I thought your last album with Herb Pedersen, Way Out West, was the most successful of your duo albums far. I enjoyed Bakersfield Bound from 1996, but I preferred the latest one - possibly due to the fact you had probably slightly more unusual covers, and possibly more original songs. What are your thoughts on the album? Chris Hillman: Well, we had more of a budget for Way Out West. We had substantially more money to work with, giving us a lot more freedom to record. So, I like the record. I think it sounds great. There are a couple of things, obviously on every record I’ve ever done - which are almost fifty five records, at this point now - every one of them I’ve always come back and said, “I should have done this differently.” There are a few things I would have changed, but all in all, I think, vocally, Herb and I get just a great blend, and it’s just a joy to sing with him. It’s almost as if we were brothers, the way we blend on our harmony. Triste: I agree - the vocal blend is extremely tight. Moving onto songwriting: you seem to be writing quite a lot with Steve Hill at the moment. Chris Hillman: I’ve been writing with him for almost eighteen years, now. Triste: I was going to say he’s probably now the longest established song-writing partner you’ve had over the years. You’ve had collaborated with many people, but he seems to be the longest established? Chris Hillman: I’m very close to him also, he’s a very, very dear friend, and we work well together, and we have a whole bunch of material we haven’t even begun to consider recording, and hopefully I’ll be doing a solo record in the next six months - maybe another Chris and Herb album too - but we enjoy it. And like I say, the biggest thing, Steve, is there’s not any pressure from, "What should I do to please radio?" or "What should I do to please a major label", and all of that is sort of not really relevant in my life anymore. So it’s fine, I mean, my radio play is really the Americana stations that are in this country, that handle anything from acoustic to Jackson Brown, James Taylor, things like that. So that’s my audience. Triste: Has the big success of the soundtrack to "O Brother Where Art Thou? ", with its mixture of bluegrass, folk and old-time country, had any spin-off benefits to acts like yourself and Herb who are working in not too dissimilar musical areas? Chris Hillman: The "Oh Brother Movie/Soundtrack" definitely opened up a lot more people to the beauty of old-time Folk and Bluegrass Music and threw Nashville a major "curve ball." Yes, it helped all of us who have been playing the music for all these years. The downside of "Oh Brother" was every Nashville Country act recording bad Bluegrass albums to cash in. Triste: And on the same theme, basically, I know in an interview I think you mentioned a while back you were thinking about doing a gospel album, where you were going to write some gospel songs with Steve Hill. Is that still feasible, bearing in mind that I presume that sort of thing is dear to your heart? Chris Hillman: Well, I’d love to do that, but I probably won’t embark on doing a complete gospel record, but I’ll probably add two or three on the next project in amongst the secular material. Triste: And if you don’t mind me asking, you describe yourself as a pretty ‘developed Christian’, I think, in one interview once. I suppose these songs are meaningful to you on a personal level - something deeper than just on a secular level. Of course, many people sing gospel songs, but obviously they have another deeper spiritual level, don’t they? Chris Hillman: Well, yeah. I’m a member of the Greek Orthodox faith, having been an Evangelical Christian back in the 80’s, and then I converted to the orthodox faith. Yeah, I’m very much devoted to that, but I don’t get in people’s face about it, or try and convert anybody! But it is my own personal belief with my family, and I sing in the orthodox choir every Sunday - sing tenor - which is really Byzantine. Part of the liturgy that they do every week, and so it’s a completely different kind of music to what I do on stage, which is bluegrass. And even when we do gospel stuff, it’s out of the old Baptist style, and Herb and I do old gospel songs in our show. It’s really completely different. And then on Sundays when I’m in town, when I’m home, I sing these very old Byzantine hymns that you would hear in a monastery. But actually, both types of music embrace each other, if you follow me. I mean I get a lot out of the church singing as well as the other. And actually I get wonderful ideas from singing in a completely different style. Triste: So at church then, you basically sing in the Eastern tradition, obviously. I presume the harmonies are different - different intervals or whatever? Triste: And another thing I’ve noticed, and it’s quite a positive thing, really, is that you have been quite consistently productive in terms of songwriting over quite a long period, really - since the mid 60s onwards. Whereas for many of your contemporaries (and I’m not going to name names) the well seems to have run dry a little bit for them. Do you wonder if it’s possibly that you have a different attitude, perhaps a more professional, kind of craftsman attitude to songwriting, than they do, or…? Chris Hillman: Well I don’t know what you mean by "the well has run dry" if you’re talking about me. I mean, we had five number one singles in Desert Rose in the 80s that I co-wrote with Steve. Chris Hillman: But I’m not dealing on that level of if one measures song writing by singles - that’s not the arena I’m in anymore. Where I have a situation where single records are part of my life anymore. So I try and write more of a positive tilt to things. One thing that does bother me - and I’ll be quite candid with you - is that I almost get a laugh out of hearing a young, 25, 26 year old song writer whining about life. And angst ridden songs about how tough it is to do this and that, when they haven’t even lived - when they haven’t even gone through the process of living, of raising a child, of maybe dealing with a terminal illness, or a death in the family, or anything of any of the above that life gives you and which you acquire through age and through living. So that kind of thing I can look at and laugh at it. I can only recall when Dylan came out with 'My Back Pages', after he had been writing for seven, eight years all these songs pontificating on different issues. And then he comes out with 'My Back Pages', "I was so much older then, I’m younger than that now", where he caught himself as going, “I don’t know enough to be saying these things”. So when I hear these young singer song writers, some of them are great, some of them I just go, "What are you whining about?!" And it’s depressing! Even some of the acts that are older, some of the women singer-songwriters are guilty of this. Some of their songs are just not uplifting and in this day and age, right now, we need uplifting things. And not something that’s sugar coated. Something honest, but something that is uplifting and gives meaning to being alive. Giving meaning to that life that you were blessed with, that you have, and that’s what I think. There is so much negativity: through film, through music, through all of the things in the media now that are so negative, that are so dark - that I’m trying to put more of a positive spin on things. There’s a song on “Way Out West” called ‘It’s going to be a good year’ - we wrote that a year before 9/11 happened, and somehow it’s quite relevant too, despite what happens, you pick yourself up and keep moving onwards, and trying to better yourself, or better, or help your neighbour, or whatever it is. And maybe that sounds trite, but that’s really something one acquires after they’ve lived a while and been through various circumstances that they’ve overcome. Triste: I totally agree. I think you got the wrong end of the question: basically the point of the question I was trying to make was that for some of your contemporaries, for example Dave Crosby, Roger McGuinn - in terms of song writing, the number of songs they’re producing now seems to have dried up. If you notice, they don’t seem to be writing songs, but you seem to have written consistently through the 60’s, 70’s, 80’s, and 90’s. Chris Hillman: I didn’t take what you said wrong, I was just giving you my take on it, and I wouldn’t comment. Roger, basically, has been responsible for some of the greatest songs in the history of pop music, as you well know. ‘8 Miles High’ he co-wrote with Crosby and Gene Clarke - and ‘You Showed Me’, and all these wonderful songs. I don’t know what he does now, but basically his show is doing old Byrd songs, which is fine because he was the lead singer and he’s very good at that. As far as Crosby - oh, gosh you know I think David’s greatest strength in music is his beautiful voice. I don’t know: the songs he writes are okay, but they’re not really something I can relate to, you know what I’m saying? But he is possessed of the most beautiful voices in music. He’s something like Freddie Mercury, you know, in that he had a wonderful voice. Crosby has that, almost, operatic tenor about him. He is the guy that enhances everybody else in their performance. But a great song writer - and one I haven’t heard anything of recently, speaking of the well gone dry - one of the greatest song writers I’ve ever worked with and played with was Stephen Stills. Look at his past track record - the fabulous stuff that he’s written and I don’t know what he’s doing now. I’m not up on what CSN are doing now, if they’re even recording anymore. But having worked with Stephen closely on a few songs, I mean, I learned a lot from him. He was almost a mentor for me - he taught me lots of things about song writing and helped me even be a better writer when I worked with him in 1972. Triste: What kind of things did Stephen Stills teach you about song-writing when you were in Mannassas with him? Is he analytical or instinctive in his approach to songwriting? Chris Hillman: Stephen always kept scraps of paper with lyrics that either didn't fit the song he was working on at the time or just writing down ideas or "hook phrases" and usually ended up using them later. He heard a song I was singing during a Desert Rose Band concert (which hadn't been recorded yet) and kindly told me , "The last verse isn't strong enough, look at it again." He was absolutely right. The song was "Running" off of the second Desert Rose Band album. I changed the last couple of lines. He actually has an amazing sense of the old "Roots music" i.e. blues, bluegrass, etc., which his partners lack. Triste: The point I'm trying to make is, looking across your generation, if you will, you’ve got people like McCartney, who writes occasionally, when he feels like it, I think; Jagger and Richards have more or less stopped writing; Dylan obviously still keeps churning stuff out, so does Neil Young and you also still keep writing. It seems to be that for some people the desire to create disappears perhaps - they’ve found other interests or other directions to move in - I don’t know? Chris Hillman: Yeah, I think - I think somehow it’s hard to keep hold of the passion you have when you’re young, you know? When you’re starting out or in your formative years when you’re really peaking, or if you have that opportunity to be that successful. But sometimes it’s hard to keep that flame lit - I guess that the best way to put it. And understandable where we’re all in our late 50s or early 60s now and, I don’t know… And like I said earlier about life: you’ve lived a whole gamut of interesting things in your life and you’re looking at things a lot differently. And it would be almost ludicrous to try and write something that you were writing about as a young man - you know what I’m saying? Triste: I understand what you’re saying, yes. Chris Hillman: When you’re older, you’re seeing things differently, and to try and put something down on paper as if you were 23 years old again wouldn’t work - it would come out very superficial. But gosh, I mean, some of the things that McCartney wrote on one of his last solo records - I think it was - I thought they were great. He’s a very melodic writer. I mean his melodies almost supercede his lyrics sometimes because he’s so melodic. He’s a wonderful musician and he still has a great time. I think all of us that have survived and get the opportunity to play are just grateful to be up there playing, you know? Whatever level you’re on - he’s obviously a much higher level as a player than I am, but I enjoy what I do probably just as much as he enjoys what he’s doing. Triste: Yeah - and going back to the old days, I presume the motivation has totally switched round? I presume when you’re a 20 something year old musician, the motivation is probably - I don’t know, women, fame and money, with a little bit about expressing your creativity thrown in there too! But it’s obviously switched round since then, since you were much younger, hasn’t it? Chris Hillman: Yeah, it does, but - I don’t know. First of all, I think Cole Porter said, “One doesn’t need to punish one’s body to create”. Meaning, you don’t have to sit and drink or do drugs or this or that to write a song. You’re not going to ever write anything fantastic when you’re in an altered state - you really aren’t. But things change. When I got into music I just loved to play: I never thought I’d make a living at it! Now the younger kids are seeing all these enticing things on MTV or VH1. I mean on every street corner whether you’re in the States or in the UK there’s a guitar player. There’s a kid with a Fender Strat in his room, or something - or a Telecaster or a Les Paul in his room learning ‘Stairway to Heaven’. And that’s fine - I tell young kids, you know, stay with music, it’s a wonderful thing, but make sure you get a good education. Because it’s a very insidious, very competitive - even if you get the chance, even if you get a record and it actually works, your shelf life is not as long as when we were starting out. You know in the old days, when the record industry was a small little cottage industry, you would get a label deal and they would keep you on the label for quite a while - two, three or four records. Of course now, with the advent of this technology, the boy down the street in the market can make up a CD at home and print up his own label and sell it, you know? But when we started out it was such a privilege to be able to get signed to a label - it meant that you really had something unique to offer. And now it’s become every man’s occupation. Which is okay! Music is a wonderful thing, everyone should play an instrument, it’s a great thing. But don’t count on having some great career in it in this day and age, right? Because of the nature of the beast. Actually, that's a great song title! It’s a good idea for a song! Triste: Can I go back - talking about song writing in particular - what actually changed you from being a musician, playing the bass in the Byrds, and being quite happy, I presume, to actually deciding, ‘Well, hang on, I’ll write some songs and contribute to the albums’. What made you change? Chris Hillman: Well I started out as being a very shy guy. I was always in the back. If you’ve ever seen an old Byrds video, I’m in the back with the drummer, sort of Bill Wyman - standing there playing the bass. I was very shy, very nervous and then I sort of started to learn how to do that. And I wasn’t a very good singer in the Byrds until, gosh, after the Byrds, and I finally got hold of my voice and learned how to sing in the late 70’s, early 80’s. But it took a long time to have the confidence, I had to learn how to do that, and I started out as an instrumentalist. But it came along where now, primarily, or in the last 20 years I was primarily a singer-songwriter. It was just sort of the nature of the evolution of the career. In a way I’m really glad I never had that confidence in the sense of being a solo star, and then wandering around now with nowhere to go. See I’ve had a very wonderful 40 years - I’ve been very lucky - where I’ve been playing all kinds of music with wonderful musicians and people like McGuinn, Stills, JD Souther, Herb Pederson - wonderful guys. So I wouldn’t change that for anything. I would have done some things differently over the years, but I sort of just fell into the sort of song writing through, oh gosh, around Younger than Yesterday with the Byrds was when I started writing a lot. Triste: Well exactly, because I think on 5D you got credit for arranging only, but then on Younger than Yesterday you get four songs and half a credit with Roger McGuinn on ‘Rock n Roll Star’. So from nothing to a flood, really! Chris Hillman: That was a good time, and the other time I really felt was a very productive time was the Flying Burrito Brothers album with Parsons, when he was focused and working hard, at that time, and those songs I’m very proud of: ‘Sin City’, ‘Wheels’, ‘Juanita’ those on that first album. Which also came very quickly, in a matter of two weeks when we were working every day, and ‘Sin City’ almost wrote itself - it was just there to be written. Yeah, moments like that, were very good. Triste: Again, I presume with something like ‘Sin City’, would it be fair to say it was mostly your song which he added to? Chris Hillman: He was asleep. I had written a verse and most of the chorus and then I woke him up, but he certainly added some interesting lines to it and we finished the song. But that’s how we worked - we worked both contributing, both lyrics and melody to the process, and like I say, 1968, late 1968, he was very focused and very disciplined. And unfortunately he never could keep hold of that mindset of work and discipline and focus. And he probably would have been still alive now and probably would have turned into a really good song writer - he was on his way, he wrote some great songs: ‘Hickory Wind’, ‘100 Years from Now’, ‘Hot Burrito #1’ and ‘Hot Burrito #2’ were fabulous songs, but, you know. People tend to lionise him now, and there’s been a lot of great writers that didn’t quite have the opportunities that he had, that didn’t even get those, like I say, opportunities, that languished into obscurity, you know? Triste: Yeah, I agree - the songs he wrote were great, but people forget, a load of the songs he wrote were with partners - yourself, for example, and then there are others. Chris Hillman: Well ‘Hickory Wind’ was a great example, it was written with a guy called Bob Buchanan. Bob was a guy that was a member of the Christy Minstrels and he was a really good song writer-singer, but Bob never gets any credit! But he wrote a lot of ‘Hickory Wind’. But like I say, Gram was on his way and I think Steve Earle even said this in the recent Sid Griffin interview for the documentary. Steve said that Gram was on his way to being a really good song writer. Was he great? He wrote a few great songs and a lot of good songs and that’s okay, but so did a lot of people! But I’m not down-playing anything that he did - he was a very innovative guy. He just fell victim, as many musicians have, to the negative influences around the entertainment business that have destroyed people. I mean, two people in the Byrds dead - Gram too. Well Gram wasn’t a full member of the Byrds, he was an employee, but still. Look at all the people that have died in the music business because of excess. Look at Jimi Hendrix! My God, they were all in their late 20s when they died and Hendrix was just doing some amazing stuff later, right before he died - I thought his blues stuff and all that was just fabulous. Triste: On the Gram Parsons tribute album that Emmylou Harris organised a few years back, you and Steve Earle covered 'High Fashion Queen', a song you co-wrote with Gram on the Burrito Deluxe album. Did you think this song was somewhat overlooked by being on the second, critically panned album, and deserved reappraisal? Chris Hillman: I finally got to re record "High Fashion Queen" the way it was supposed to be played and sung. The first version on Burrito Deluxe was just plain awful. Singing it with Steve Earle was a pleasure and, I must say, it's maybe the best cut on the tribute album. Triste: When you actually do write nowadays, do you write with an instrument in your hand, or do you write in your head, or do you use a tape? What techniques do you use? Chris Hillman: You know what, I actually wrote a song on the mandolin - which is the first time I’ve ever done that! - about 3 months ago, which I do perform on stage. I don’t know whether I did it in the UK. But it’s a real mountain ballad-type thing called ‘The Other Side’. But normally I have a guitar, and if Steve Hill’s over here, he’ll be typing and I’ll be playing and singing and he’ll grab the guitar and say, “What do you think about this melody?” And we laugh, and we say, “That’s terrible!” and “Get out of my house!” But we have such a close relationship that we can edit each other. And that’s what works. I think when you write with somebody you really need to know that person. And I never really was fond of the national concept of going down there and writing with four people in a room and cranking out these sort of generic country songs. You need to know the person you’re working with so you can really feel what they’re feeling at the time because you’re trying to create something as one entity, you know? So that’s something that adds to the success of Jagger and Richards, and Lennon and McCartney: obviously they grew up together, they knew each other, they were so close and look what they developed together. So I go on that premise, and it worked with Roger and I, and it worked with Stephen and I, you know? Gram and I were literally room-mates in a home and were very close friends and able to relate to each other. And that’s what you’re getting - the benefit of two minds in that self-editing process, you know? I think my best work has always been with other people, although the first stuff I wrote, ‘A Time Between’ and ‘Have You Seen Her Face?’, I did by myself. And some of the lyrics are sort of silly, but the idea was there. And ‘Have You Seen Her Face’ was one of my favourite songs, that I’ve ever written, and it just came out of me one day. Triste: Do you feel like somehow there’s a competitiveness, or a friendly rivalry when you’re co-writing? There’s you and somebody else, and you’re both writing together and you obviously want to impress your partner. Maybe it spurs you on where you might have been a little bit lazy, perhaps, and just let things go, I don’t know? Triste: No, I meant something like McCartney and Lennon - where for example McCartney wrote a weak lyric, he’d know that Lennon would maybe pounce on it and improve it, and it’s a little bit of creative competition. Chris Hillman: Yeah, yeah, that’s under the guise of ‘self-editing’, where you’re edited by your partner, where he knows you enough to say, “God I don’t like that. That is a throw away line, let’s try this…” And the other guy can either say, “Okay, you’re right,” or he can say, “No, let’s stick with it for a little while and see how it goes and we’ll re-look at everything tomorrow.” So what I’m saying is, you finish the song, you haven’t agreed to change it but then you look at it and 9 times out of 10 your partner’s right, and you say, “You’re right, you know, that was a throw away line, let me fix this - let’s fix this?” And then you know with McCartney and Lennon of course at the end, they were writing stuff themselves and they would publish it or copyright it as Lennon/McCartney, when sometimes it would just be Paul that had written the song, you know? But initially as they started out it was the two of them. And I’m sure that’s happened with Jagger, and whatever. Triste: Do you ever feel aggrieved that you sometimes seem to be overlooked by critics when they’re looking back over rock history? You know, the kind of thing where they about ‘Gram Parsons songs’ such as “Wheels” and “Sin City” or McGuinn’s “So You Want To Be A Rock And Roll Star?” and forget that you were the co-writer? Chris Hillman: Sometimes in a weak moment I feel slighted. But I know who I am and what I've done. The Entertainment Industry feeds on your self importance. When an artist has died young and is not accessible he or she can easily take on "Icon Status" but that happened to Mozart a few centuries back too. I wouldn't trade places with any one them. My life is ever so blessed. Triste: Can I ask you one final question? Triste: This is a bit of a ‘fan’ type question, if you don’t mind, but I was talking to Gene Parsons and he was saying that he remembers vaguely playing with you, Clarence White and Gram Parsons together. Was that a kind of a prototype Burritos? Did you four ever get together and discuss being in a band or was that memories playing tricks? He seemed to think you rehearsed a few numbers but it didn’t work. Chris Hillman: I think he was describing a show after I left the Byrds and then I got in the Burritos with Gram - I think we did a show together and we might have all played together on stage, I’m not quite sure. But I did do one show together with Gene and Clarence - that was probably the day I quit in a huff: not something I care to remember… But Gene’s a good musician, always was. I think he’s good song writer and singer, but I didn’t feel he was as strong on the drums as he was on guitar and banjo. That’s what he really was good on - but his drumming wasn’t quite my style of drumming, you know? But certainly a very good musician and a very bright man. I mean, he invented that wonderful string-bender device with Clarence, you know? Triste: And a very pleasant man, as well. He’s a very nice man to speak to. Chris Hillman: He’s a very nice man! Triste: It’s a quality often derided, but he is a gentleman of the old school.